I traveled to the UK at the age of 23, and my days struggling to become a photographer continued. Although unexpectedly, I joined a Japanese theatrical company named Red Buddha, led by Tsutomu Yamashita, as an actor. Part of the reason was to earn some money for living and to extend my visa. But at the same time, as I was once interested in becoming an actor during my junior high school days, it was a good opportunity to fulfill my curiosity. I applied for an audition, and fortunately accepted by accident. The group was popular enough that Mick Jagger would come to see our play when we had a performance in London. After the London performance and European tour in several countries, I decided to leave the group when the group completed its 100th performance. There was no chance for me to become a famous actor, and I also felt strongly that I should pursue my original dream to become a photographer at full power without dithering. It was six months after I joined the theatrical company. Leaving the drama group meant loss of income and loss of a means to extend my visa. But, I did not think too seriously about the future. The money I had at that time and duration of my stay stamped on my passport were the limitation of my free time in my life to pursue my dream. In a few months, I will have to go back to Japan. In the spring of 1975, I went to the Photographers Gallery located in Leicester Square. It was a very famous gallery in London, where all the excellent photographic works gather from the world. Accidentally, I met two British young men in the mid 20’s, similar to my age, named Chris and Adrian. We had a chemistry, and they gave me their address. Next week, I visited their place. It was a four storied warehouse in the warehouse area near London Bridge and close to the River Thames. Most of these warehouses ended their role as a warehouse with the trend of the times. Many of them were somewhat renovated and used as a studio and residence for artists. The warehouse I visited was used as a basis for activities by a group of ten photographers. Their purpose was to prepare for a large sized photo exhibition named “Quality of Life” scheduled to be held in 1977. There was a large dark room in the basement, a meeting space with a skylight window on the fourth floor, and several people were living. These warehouses, the relics of the British industries, were 50 years or probably 100 years old, and they were aging. As I visited their warehouse, I was introduced to some of the group members, and they showed me the dark room as well. At that instance, I felt my photographic fever boiled up. On that day, I was given with a box containing 100 sheets of cabinet size photographic paper. I asked them to let me use the dark room from that night until the next morning, and I made 100 prints from the negatives I took in the UK and in Europe. I accepted their offer immediately, and became a member of the team. Although everything started accidentally, it was a dream come true for me. After sharing the preparation period of two years with them, a large scale phot exhibition was held for six months at the National Theatre, which was just completed. Among the total of 300 or more photos, 30 plus photos of mine were included. After that, the exhibition was held for a few months in a gallery of a town where the birthplace of Niépce, a French photographer, exists. During my three years in the warehouse, we had many people visiting us. Sue Davis, director of Photographers’ Gallery, Ian Berry, a photographer belonging to Magnum, David Robinson, movie critic of The Times and a researcher of Chaplin, Tony Rains, also a movie critic for Time Out magazine, Derek Jarman, a movie director, and Joseph Koudelka, also a member of Magnum. Since Czechoslovakia was invaded by the Soviet Union in 1968, Joseph Koudelka left his home country, and has been taking photos of gypsy and the scenery in front of his eyes through his unique viewpoint while traveling alone in France and the UK. He was always wearing a Khaki military jacket and brown round eyeglasses. 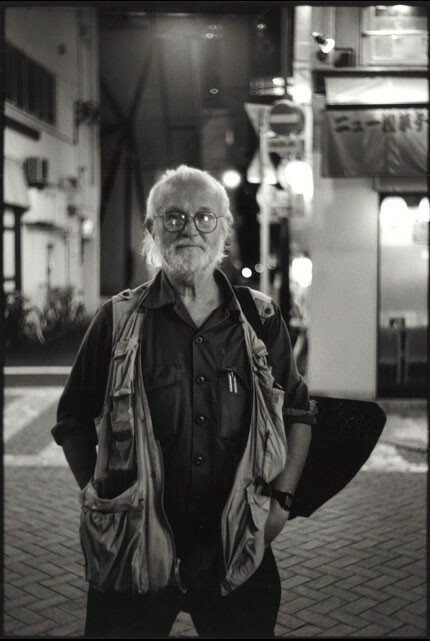 He was always carrying two Leica M3 or M4 black body on his chest. When I met him for the first time, I asked him if it was OK to take a photo of him. No matter what, he was a Magnum photographer. I wanted to take his photo as a commemoration. “Sure, but take one when I don’t notice”. He was a shy person. The photographers in this group and Jürgen, the director, were all using Leica camera. In those days, as I had the largest room, Joseph stayed in my room one night. Whenever he visited our warehouse we spent time sharing the photos of each other. While we shared our recent photos, there was a photo of a few old men that Joseph liked very much which I took a few years ago in a small village in Spain. “Among your photos, they say the one with a rich Kuwaiti man in his bed to be the best, but I like this one much better. It represents your style.” Such a conversation was really enjoyable to me, exciting and honorable, and I was really impressed with the progress of things which was possible only in London. Although he joined Magnum being recognized by Bresson, Joseph had no home country to go back to, and he was taking photos of gypsy, people and scenery while wondering around in Europe. My interest was to ask him “Are you not lonely being alone? Do you ever regret for being a photographer?” For me, I was sometimes excited to think about the group photo exhibition which was scheduled to be held soon. On the other hand, I had no family living together, I had no lover or a partner to share my living for the last 27 years. As a result, my heart was always trembling for loneliness. Probably because I was young in the 20’s, however, I had a strength just enough to endure the loneliness, and I also believed that being alone was better in taking photos of warm hearted people. Joseph neither admitted nor denied his loneliness. He merely opened his arms wide left and right. But such gesture made me feel that he was also lonely. He also said “Once I decide, I will not worry about it.” As far as his words were concerned, I could not feel any weakness in him. At least his words made me feel good. I strongly realized that it was my dream to take as many photos as possible and as I wanted to. It was in 2011 that I met him again at the reception of his personal exhibition at Tokyo Metropolitan Museum of Photography after 30 years of separation. A few days later, he gave me a call, and I visited Hill Top Hotel where he was staying. We went to the bar in the basement of the hotel, and ordered beer and pizza. Then, many questions to ask him came to my mind. “My next photo exhibition in Tokyo is already scheduled to take place two years later. Won’t you come to my room as I want to show you my plan”. As soon as I entered his room, he picked up his M6TTL with 35mm Summicron mounted, aimed his camera at me, released the shutter in an instance, then threw his camera on his bed. It took only 0.5 seconds. His quick photo shooting action was the same as his action I saw in London. It was so quick that I could not judge whether he took a photo or not. A thin stick which looks like a tooth pick or a matchstick is glued to the camera cone which enables to measure the focus distance manually. I monitored his face through my MP, also with a 35mm lens mounted, and released the shutter. It took me 2 seconds. We took each other’s photo by demonstrating each one’s photo shooting timing. At midnight, I left his hotel. A fresh wind was blowing on Surugadai hill. It was April 2013. He came to Tokyo again for coordination of his personal exhibition to be held at Modern Art Museum, and he called me again. We met at Magnum office, and presented the 8x10 print of his portrait that I took last time. He seemed to like it very much. “This time, you must take it with you.” “OK!” And he put the photo in an envelope importantly. Then, I showed him a slideshow with my laptop. It was a series of portraits of the people of Tohoku suffered from the 3.11 disaster with MY WAY sang by Sid Vicious as the background music. The song was 3 and a half minutes long. Although he said he was not familiar with music, I could see him drawn into the screen as the music progressed. Finally, he stared at the screen as if embracing the screen. When the slideshow finished and “JAPAN the country of the rising SUN” appeared on the screen, “Are you all taking such photos?” he looked around at me and others in the area. I was happy because he was at least impressed. After that, two of us went to a Japanese style pub in Kanda Ogawa-machi. We toasted with beer celebrating the exhibition to be held at the Modern Art Museum. The topic of our conversation proceeded to photographs as usual. In Paris, the cost to develop film is very high. The cost is substantial. On top of that, the equipment weighs almost 30kg. Therefore, I am thinking of having Leica S2 modified to panoramic format for the next photo. By the way, the portraits of Tohoku people. How could you establish such a close communication with them?” Both of us are happy with only a glass or two of beer. And any food served in Japanese style pub is OK. Probably he can enjoy any food while travelling in the world. Outside if the Japanese style pub, I wanted to take a portrait of him. My Leica M6 has Summitar 50mm lens mounted. “May I take your photo in this alley?” “Of course, Yes!” His figure, with his face looking straight into the camera, against the background with street lights in the dark was especially impressive and we were connected with deep visual line of understanding each other. Another day to see him came unexpectedly. In late October of 2013, he came to Tokyo one week before the opening of his exhibition at the Modern Art Museum, and he gave me a call from his hotel. He was staying at a new and chic hotel in Suidobashi. After a while passing the meeting time, he came down to the lobby. And he introduced me to his daughter. His 26 year old daughter was extremely pretty. She was tall, and had cute face, long hair, and intelligent attitude. She, living in Paris. As soon as we met, he and I hugged each other firmly with our arms around the shoulder of the other. His first word was “Did you bring the photo of me from the other day?” He was talking about the last portrait I took at night. It was fortunate that I brought the print on baryta paper hoping that I could show the photo to him. “Yes, I did.” I took the print out of an envelope and gave it to him. “Ha, ha, ha! It’s great!” As soon as he saw the print, he laughed with a loud voice. His daughter also looked at the print from the side and said “It’s great!” quietly and smiled. I thought the father and the daughter looked very sweet and nice. We went to a Japanese style pub near the train station. We always go to a pub. I thought a fancy restaurant would not be suitable for him. Joseph and I sat side by side on a table for four, and his daughter sat facing Joseph. He was especially talkative that night. Probably he was happy for the forthcoming photo exhibition, and the fact that his lovely daughter came all the way to Japan made him happy, I imagined. Joseph seemed to like my expression of “ land mark on this planet”, and he repeated “on this planet” smiling. As I watched the conversation between Joseph and his daughter, I had some mixed emotion. During my UK days and when I met him in Japan, he told me about his family little by little. But I never asked him much. But what I imagined was, in order to continue taking photos as a drifter like him, even if you say you were living by yourself, you cannot get away from the fact that you have friends somewhere, loved one somewhere, and relatives or blood-related existence somewhere. In order to abandon them in their homeland, you have to fight against a certain level of conflict in yourself. If a photographer is giving loneliness or sorrow to someone while living his life as a photographer, what kind of excuse do we have? I was exactly one example of that. I have been continuing my journey to become a photographer for 10 or more years. At the age of 23, I said goodbye to my parents and left Tokyo. It was only 8 and a half years later that I came back temporarily to my parents. Soon after that, I went back to London. And one day, I learned about passing of my father over phone in my small apartment room in London. While I was pursuing my dream to become a photographer, how much loneliness did I impose to my parents. “That tiny and weak son, can he ever become a photographer in overseas?” Probably that was the concern my dad had looking toward the sky in the direction of the UK in the bottom of his heart whenever he remembered my face. I said to his daughter that he was not taking photos with superficial tricks or techniques. That is why his photos are strong. His photos are admired by all the people in the world. His new photo album titled “WALL” is the same. Your dad hates walls which take away freedom from people. We paid the bill, and went out to the street at night. It was late October in Tokyo already cold. Last time, too, I took a photo of Joseph in town at night. Tonight, together with his daughter. I aimed at them with my Leica with 35mm lens on, and released the shutter for 2 or 3 times. After some soft shutter sound, I saw Joseph’s smile . The two walking away from me on the sidewalk at night, consisting of a father who is enjoying his temporary rest during his travel with his daughter, looked very peaceful.